A RARE METAL CHARITY CONTAINER. Hammond, Indiana, c. 1955. 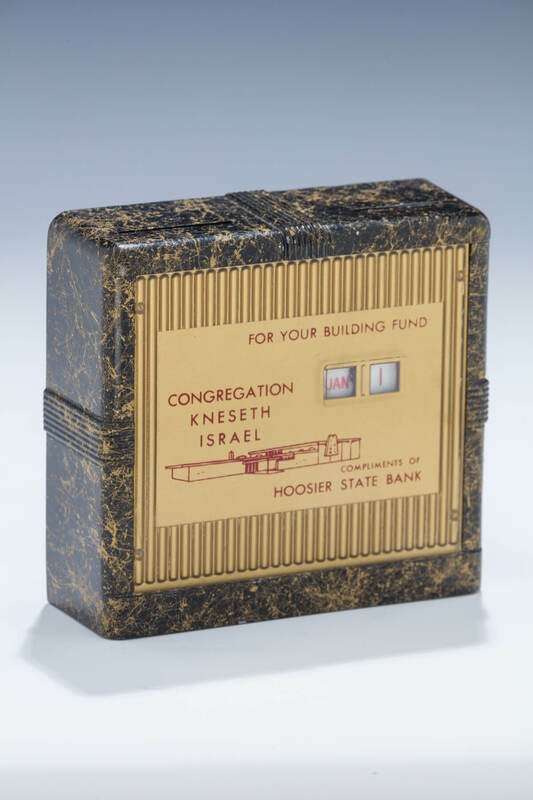 Collecting funds for Kneseth Israel of Indiana. Compliments of Hoosier State Bank. Congregation Kneseth Israel was formed in 1902 as an Orthodox synagogue by 15 Jewish men of the Hammond Jewish community. The new building, which was dedicated in 1958 was located on Hohman Avenue.The congregation lasted by itself until 1976 when it merged with other congregations to form Congregation Beth Israel (CBI). Th Hohman Avenue building was used until 2004 by C.B.I. 4.2” wide.